The flavours of a hot cross bun in a cream and marmalade filled doughnut. In a small bowl, mix together the water, caster sugar and yeast. Set aside for 10 minutes or until yeast begins to foam. In a large bowl or bowl of a stand mixer, mix together the flour, salt, mixed spice, cinnamon, raisins, mixed peel and orange zest. Add the eggs and yeast mixture and combine using either your hands or a dough hook. Knead the dough for a further five minutes before slowly incorporating the butter. Continue to knead until dough becomes glossy and smooth. Leave to rest for two hours, or until doubled in size. Once dough has double in size, cut into 12 even portions. Shape into balls, cover loosely with clingfilm or a damp tea towel and leave to prove for a further 2 hours. Fill a large heavy bottomed pot with 4cm of oil and place over a medium to high heat until the oil reaches 180°C. While the oil heats up, take a cooling rack and place two layers of paper towels on top. Combine white sugar and cinnamon on a tray. Gently lower the doughnuts two at a time into the oil and fry until golden brown on one side, this should take around 2–3 minutes. Carefully turn the doughnuts and fry for an additional 2–3 minutes. Once cooked, drain off any excess oil and toss in cinnamon and sugar place on the cooling rack lined with paper towels. Repeat with remaining doughnuts. Filling: Once doughnuts are completely cool, whip cream and vanilla until soft peaks form. To assemble: Make a large cut into the top of each doughnut and fill with whipped cream and marmalade. Makes 20 doughnuts. 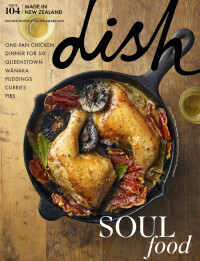 Olivia Galletly is a passionate home cook based north of Auckland, with a penchant for inexpensive, seasonal, feel-good food. To enjoy Olivia's backlog of reimagined casual-cool fare, visit her blog The Hungry Cook.